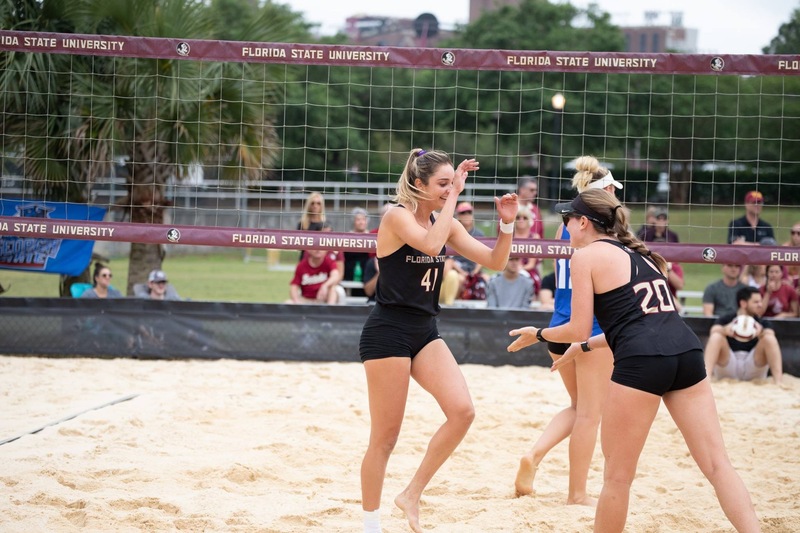 Since its inception, Florida State beach volleyball is the only team to win the Coastal Collegiate Sports Association title. That’s what the Seminoles will look to defend this week in Emerson, Georgia. FSU will be the top seed in the CCSA Tournament, which gets underway Friday. The Seminoles are in Group 1 and will be paired with No. 8 seed College of Charleston and 12th-seeded Southern Mississippi. The top two teams from each pool will advance to the quarterfinals on Saturday, which follows elimination games. The semifinals and CCSA Championship will both be played on Sunday. The first match for FSU during the tournament takes place at 9 a.m. EST on Friday against Southern Miss before facing the Cougars later in the day at 3 p.m. The Seminoles are 17-0 all-time in CCSA Tournament matches. For the season, FSU is 23-5. The Seminoles defeated LSU for last season’s CCSA title. LSU is the No. 2 seed and top seed in Group 2. The No. 3 seed is Florida Atlantic and the No. 4 seed is South Carolina.